It’d been so dang close the last few years, what with the FSU secondary, in the words of the ABC announcers, “getting away with manslaughter” and all. But 1990 was going to be the year. The Florida State game was such a big deal—Auburn was ranked 5th, FSU 7th—even Paw Paw, who isn’t really that in to football, agreed to drive the motor home around the Smokeys to try to find a campground with not just sewage hookup but with something close to cable or at least a place with decent signal. And he did, and the cousin and I grabbed the Pop Tarts and Shasta and camped out on the bed in the back glued to the snowy screen to see if this new freshman sensation quarterback of ours could finally beat the Seminoles. The reception was bad. Jim Von Lyl’s kick was good. I remember being so bummed out we weren’t back home in time to see the review. I remember hearing the locker room footage at the beginning was wild. It’s, like, 1980s football movie wild. Auburn linebackers coach Reggie Herring—who, we should remember, was one of the best linebackers in Florida State history… who, we should remember, had just been inducted into the Florida State Hall of Fame—looks like a berserk, balding Dauber from Coach as he leads the locker room in the FSU war chant (which, hey, apparently began during an Auburn game / win) only to to be hoisted into the air by one of his soldiers and swallowed alive in merciless sea of tomahawk chops. Then Pat Dye, cigar in hand (again), summons Ricky Sutton to the altar to praise him for his game-changing, fourth down sack of FSU quarterback Casey Weldon. And by praise him, I mean whip him—hard—across the head with his Auburn baseball hat. 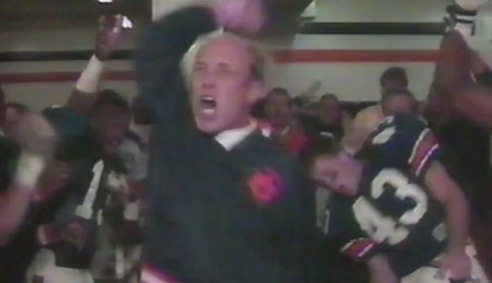 “I think the scene in the dressing room there with Coach Herring… displayed what all of us else felt about as good anybody could,” a laughing Pat Dye told Phil Snow when it came time for commentary. “And he’s a fiery guy,” Snow replied. Herring’s currently coaching linebackers for the Chicago Bears. Related: Smokin’ the Competition: Pat Dye and the victory cigar culture of the 1980s Auburn locker room. The Auburn players and coaches weren’t the only ones chanting that night. I remember very distinctly that was the game we took BACK the “war chant.” Every time the FSU faithful tried to start it up that night in Jordan-Hare, the Auburn fans completely overwhelmed them by throwing that same chant right back at them. I will never, ever forget the stunned looks of utter confusion on the faces of FSU fans as we drowned them out with their own chant. This is (all wins over UAT removed) my favorite win in Auburn football history. In the 89 game, FSU won and as our team left the field the Marching Chiefs played Rocky Top (Auburn had lost to Tennessee 2 weeks prior) and then played our fight song off key. And then BLAIRED the War Chant. No one at the stadium in orange and blue was pleased one bit. The moment that December 2nd, 1989 was over, this was the next circle the wagons game on the calendar and it was an honor to be in attendance. I was in the stands for that one and still tell the stories today. We were there well over 30 min after the game was over tomahawkin and just absolutely going nuts. Players came back out and rousted us into a frenzy again. It was a beautiful night on the plains!